Now in its 12th year, Belfast’s Christmas Market is set to expand beyond the grounds of City Hall for the first time. What is new this year at Belfast Christmas Market? There will be 20 additional stalls located at the front of City Hall, just outside the main entrance gates, featuring local food and craft producers. This year sees the addition of some new features at the market including a specially commissioned fairy trail from the Irish Fairy Door Company, a vintage helter skelter and a number of new traders including local company Rossi’s selling their unique Ice Cream Chimneys. As well as the famous culinary delights from around Europe including Italian nougat, Belgian chocolates, French tarts, German sausage, Spanish paella and Dutch pancakes, the aim of this year’s market is to put local produce on the map. 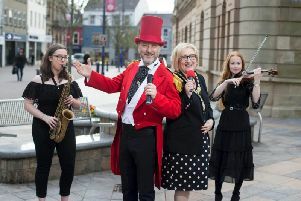 To celebrate the finale of the NI Year of Food and Drink, the chalets at the front of City Hall will have a festive array of locally produced food and craft. Among those stalls will be the winner of the Pitch Perfect competition, Belfast Beard Company, who are meeting a huge demand for male grooming products such as beard oils and balms, moustache wax, beard combs, shaving products and a range of wearables including T-shirts and hoodies. Husband and wife owners Adam and Laura Henshaw said they felt the prize location at the Christmas Market could be “a starting point for something incredible”. When is Belfast Christmas Market open? The market opens at noon on Saturday and will run until Thursday, December 22. The continental market, run by Market Place UK, is open from 10am-8pm Monday to Wednesday, 10am-10pm Thursday to Saturday and from 1pm-6pm on Sunday. On Thursday December 22 the market will close at 6pm.